Intensely Revitalizing Facial Oil Review: Does It Provide Benefits? Oils Of Life Intensely Revitalizing Facial Oil contains three seed oils that are well known for their repairing and revitalizing properties. It claims to replenish the skin’s moisture and bring back its radiance. Lastly, it visibly reduces carious signs of aging. Read this Intensely Revitalizing Facial Oil Review to know more details about this product! Oils of Life is a product of The Body Shop, a company which was established by owner Anita Roddick with the aim of enriching the environment and their users instead of exploiting them. Anita’s only mission is to use business as a force for good. For best results, apply 1 to 2 drops (if you have oily or combination skin) and 2 to 3 drops (for dry skin) into your neck and face. Gently massage it into the skin for a few minutes. Use this in the morning and at night. Follow it up with any Oils of Life moisturizer of your choice. 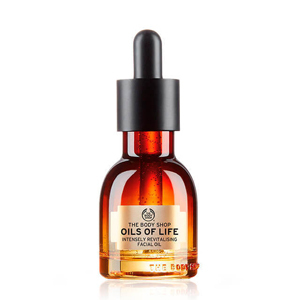 Oils Of Life Intensely Revitalizing Facial Oil comes in two sizes—1 fl oz and 1.7 fl oz. The bottles are sold for USD 39 and USD 55 respectively. It is available in The Body Shop online shop and retail stores. Camelina sativa Seed Oil: This functions as a good skin moisturizer and a nice massage oil. It is rich in omega oils and vitamin E that can help enhance the skin tone as well as protect the skin from free radical damage. Rosa canina Fruit Oil: This extract is proven to reduce irritations in the skin and boost its overall hydration. It can also visibly reduce the look of wrinkles and scars. Nigella sativa Seed Oil: This has high levels of antioxidants that can nourish the skin. It can also prevent and treat skin inflammation. The facial oil is recommended for all types of skin. The oil is 99% natural. It is lightweight and is quickly absorbed by the skin. It leaves a non-sticky finish. It contains fragrance and fragrant chemicals. The oil also has alcohol. Many users claim that the oil leaves a greasy feeling on the skin. This oil promises to nourish the skin from the inside out and keep inflammation and irritation at bay. However, it contains lots of irritating ingredients like fragrances, fragrant chemicals, and alcohol which have been associated with increased risk of irritation. 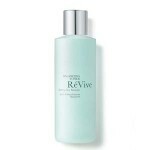 It would be best if you will choose a revitalizing oil that has a much more gentle formulation than this product. 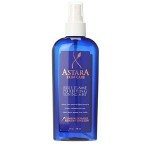 The purchase of Oils Of Life Intensely Revitalizing Facial Oil is backed up by a return policy. If you did not like its effects, you could return the item to one of The Body Shop retail stores or their online shop via mail. Using a toner on the skin is an important part of a complete skincare routine but often neglected by many people. Toners not only help remove all excess traces of skin cleansers but they can also help restore the skin's PH balance and encourage the blood flow to the skin cells. The toner one chooses should be matched to the skin type and contain natural, pure ingredients that have undergone clinical and consumer testing.